If you are a vapor chaser, then you are no stranger to the high power kit. The stronger output will allow us to get more vapor instantly. There will be a lot of friends pursuing the larger vapor and choosing the mechanical Vape Mod, but this will bring more danger. I think you need a Vaporesso Polar 220W TC Kit. 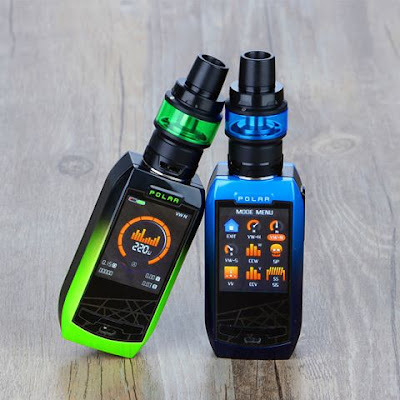 What is Vaporesso Polar 220W TC Kit? This is a Vape Kit with a maximum output of 220W. This device is equipped with OMNI Board 4.0 chip, let us get a safest experience. It comes with burn protection, overtime protection, overcharge protection, no load protection, low value protection, ESD circuit protection, short-circuit protection, low power protection, pass-through protection and more. Everything it does is to give us a safer experience. There is also one of the biggest surprises here. Polar has a 0.001s firing speed! This is an important reason why this product is so hot. It guarantees the best performance of the CASCADE Baby SE Tank at ultra-fast ignition speeds. I think this is an irresistible product for vapor chaser, right?